Votes on amendments to Theresa May’s deal will be held today and possibly on 27 February, too. Prime Minister Theresa May listening to Labour leader Jeremy Corbyn. BRITISH PRIME MINISTER Theresa May has suffered another humiliating Brexit defeat at the hands of her own eurosceptic MPs this evening, with just weeks to go until Britain officially leaves the EU. In the symbolic vote, MPs voted 303 to 258 against a government motion endorsing its next moves in trying to secure a new withdrawal deal with the European Union. That this House welcomes the Prime Minister’s statement of 12 February 2019; reiterates its support for the approach to leaving the EU expressed by this House on 29 January 2019 and notes that discussions between the UK and the EU on the Northern Ireland backstop are ongoing. This would have caused a problem for some hardline Brexiteers: it meant that they must vote for both the Brady and Spelman amendments, or vote for neither. Many in the ERG, or a group of hardline Brexiteers, aren’t in favour of the Spelman amendment, as they see a no-deal Brexit as a viable and realistic option. On Tuesday, May announced to the House of Commons that she had suggested three options to the EU on how to get the changes to the backstop needed to secure MPs’ approval (those are an alternative backstop, a time limit to the backstop, or a unilateral exit from the backstop). With no update to the current Withdrawal Agreement on offer, she announced that if this remained the case by 26 February, another statement would be given to the House and a another motion would be tabled on 27 February. MPs voted on this and more amendments this evening. 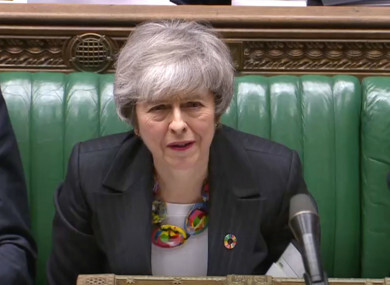 The similar debate on 29 January was on a motion which asked lawmakers to agree that they had considered May’s latest statement on the Brexit negotiations. Seven proposed amendments to this were made, and two were passed: the Brady amendment, which said that the backstop should be replaced with unspecified “alternative arrangements” (passed by 317 votes to 301); and the Spelman amendment, which rejected a no-deal Brexit (passed by 318 votes to 310). It’s been argued is an impossible assurance to give without a House majority for a deal. What was being voted on today? There were also other amendments to the motion today (so, amendments to the already-amended motion). Conservative Anna Soubry and Labour’s Chuka Umunna’s amendment (e), which “instructs the Government within seven days to publish in full the most recent official briefing document, relating to business and trade, on the implications of a no-deal Brexit presented to Cabinet”. Email “Theresa May suffers another Brexit defeat as MPs vote down motion ”. Feedback on “Theresa May suffers another Brexit defeat as MPs vote down motion ”.